Log-in is allowed for students (grades 6-12) and parents (grades GK-12) currently enrolled at Daegu International School only. For your ID and password, please refer to your PowerSchool access information. Our mission at DIS is to help students become successful contributing members of a global society by providing a safe nurturing environment in which students can reach their maximum potential, socially, emotionally, and intellectually. 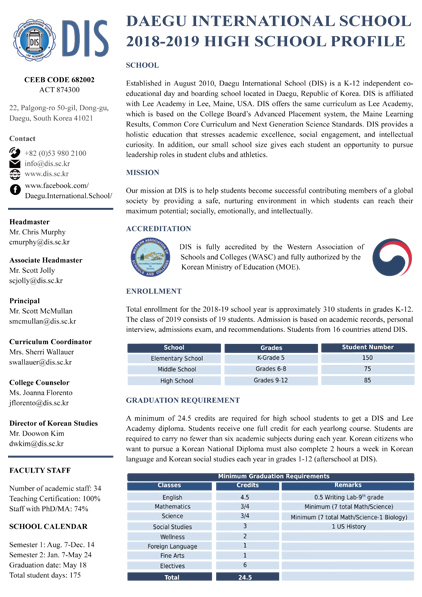 Daegu International School is fully licensed by the Ministry of Education, Republic of Korea and is recognized by the Department of Education, Maine, USA as an associated school of Lee Academy, in Lee, Maine, USA. Lee Academy is a member of the Maine Association of Independent Schools, the Independent Schools Association of Northern New England (ISANNE), and The Association of Boarding Schools (TABS). Lee Academy is accredited by the New England Association of Schools and Colleges (NEASC). Because of this partnership with Lee Academy, students who graduate from DIS receive both a DIS diploma and a Lee Academy diploma. DIS is accredited by the Accrediting Commission for Schools, Western Association of Schools and Colleges. Copyright DIS. All rights reserved.